Artificial intelligence researchers have started looking to some of the simplest creatures for inspiration. Cyborgs who think like humans are still just a sci-fi dream, but scientists have had success recreating a less complicated brain. 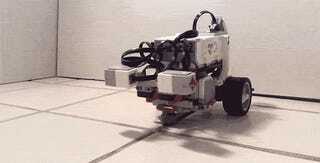 They've already created LEGO robot with the artificial mind of a worm. The OpenWorm project (which kind of sounds like somewhat like a band of mischievous 10-year-olds with a pocketknife would call themselves, but OK) has mapped the brain of the tiny nematode worm Caenorhabditis elegans (C. elegans), known both for being squirmy and only having 302 neurons. One of OpenWorm's founders, Timothy Busbice, applied the brain mapping to create software that mimics the way the natural neural network works. Then he put it in a LEGO Mindstorms EV3 robot. And then it started its mechanic wriggle. "My research takes the way the worm's brain is wired and extends it to a robot for sensory input and motor output," Buspice told me. "What we found is that rather than just random, crazy movements by the robot, it actually responded to it's environment in the same manner as the biological worm." Since C.elegans can smell, taste, and sense light and temperature, the robot has sensory neurons, too. Busbice essentially reverse-engineered a worm nervous system onto a robot using sensors and software. The robotics expert is now using a Raspberry Pi and a GoPiGo (a robot built to interact with Raspberry Pi) to test his worm-brain software again. So far, he hasn't been happy with the results, but he's still working on the experiment and making adjustments. "My goal is to create a autonomous, "living" robot that could be used for multiple purposes," Buspice said. "In my original work, we sometimes let the robot wander the house and it's like having a pet wandering around - pretty cool and fun."